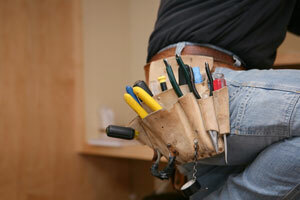 Tired of looking at tools scattered all around the garage, or do you need something to hold your tools at work? Having trouble organizing when setting out to fix something? 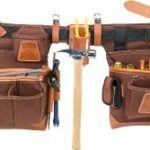 It sounds like you could really use a tool bag! 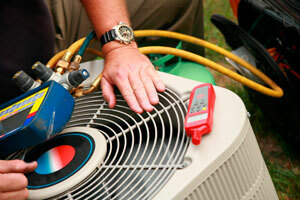 Since there are plenty of products available, you’ll easily find the one that best suits your needs. And it doesn’t really matter whether you need it for your garage or to take with you to work. 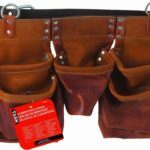 What follows is a list of some of the best tool bags available. 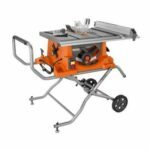 As its name suggests, WORKPRO is a company that specializes in making top-quality gear for repairmen. This particular product offers high levels of functionality and durability for a great price. But let’s check out its features! 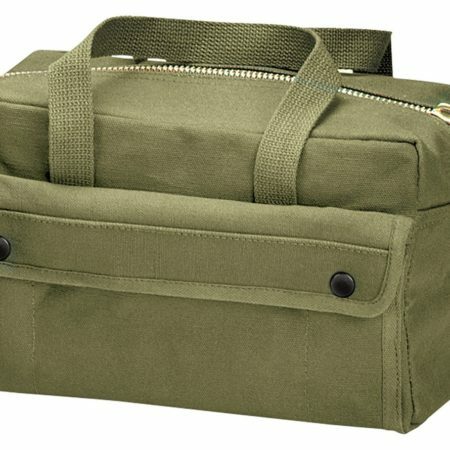 This 14-inch bag provides enough space to store a whole bunch of tools. It has six pockets on the inside and seven on the outside. One of the exterior pockets closes with a Velcro patch, which makes it ideal for storing smaller items. The bag’s equipped with two hand straps and one adjustable shoulder strap. The latter can be removed for your convenience. Apart from being very convenient, this product is highly durable as well. Its bottom is enforced with rubber foam, which makes it less likely for the tools to get damaged. The rest is made of top-quality polyester. People who’ve bought this bag are more than satisfied with it, and have only two minor complaints. Some think it would be better if it had more than one Velcro pocket. Others say it gets hard to zip up once it’s full. All in all, this tool bag deserves to be our number one choice! 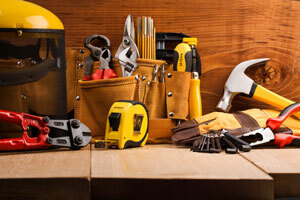 Stanley offers some of the best storage options for your tools. Their bags are among the most highly rated, which is why we’ve decided to review this 12-inch model. As you’ll see, it could make a world of difference in how you organize your garage! Thanks to its 12-inch capacity, this product is capable to hold all the essentials. It has a total of six pockets. All of them are placed on the outside, and one is equipped with a Velcro patch. This allows you to store nails and other smaller items without worrying about losing them. Its handles are padded with cotton, making it easier for you to carry the bag around. In order to protect the contents, the bottom’s equipped with rubber foam. 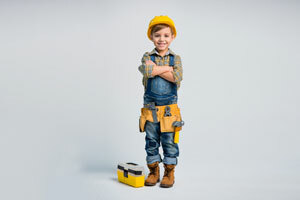 The product itself is made of sturdy 600-denier polyester. 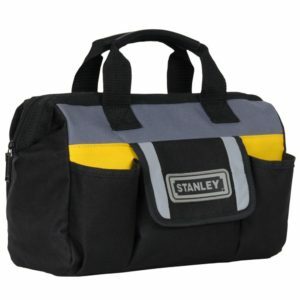 There are two downsides to owning the Stanley tool bag. Number one, it doesn’t have a shoulder strap. Number two, it’s not equipped with interior pockets. However, if you don’t think this would be a problem, chances are you’ll be very satisfied with the product! You might have already heard about Rothco. After all, it’s one of the biggest military gear brands. As such, it’s known for making tool bags of the highest quality. And this is one of their best models! 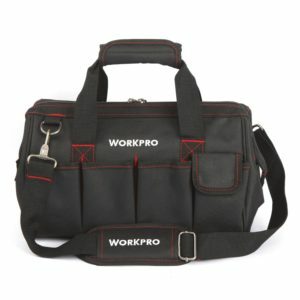 This 11-inch tool bag is the third most highly rated storage option available. It’s equipped with eight interior and two exterior pockets. The latter are quite large and close using snap fasteners. 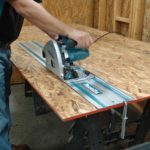 They’re great for both smaller tools and other accessories. The main pocket closes with the help of a reliable brass zipper. 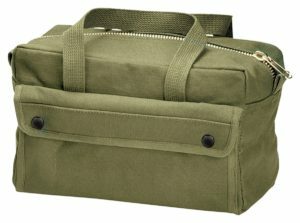 Made of sturdy canvas, the bag is at the same time durable and lightweight. This makes it the ideal storage option for those who’re always on the go. One of the biggest disadvantages to using the Rothco model is its size. Although 11 inches is enough for the essentials, it can’t hold as much as the other items on this list. Apart from that, the only objection users make involves the lack of a shoulder strap. All things considered, however, this could prove to be the ideal addition to your equipment! If you want a bag that’s both spacious and easy to use, it might be best to choose a Custom LeatherCraft model. What follows is a review of a product you’ll surely like! 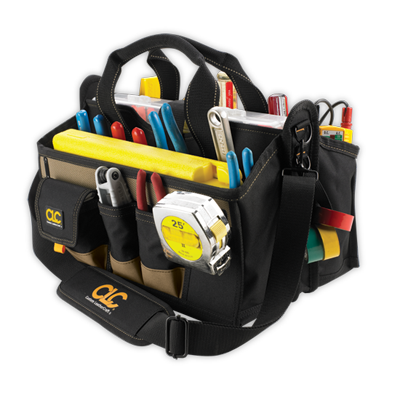 When it comes to capacity, this tool bag is the best on the list. It’s a 16-inch item, which is two inches bigger than the second largest model we’ve reviewed. Also, it’s equipped with the most pockets. It has eight on the inside and another eight on the outside. Another great thing about it is that they’re of different types and sizes. 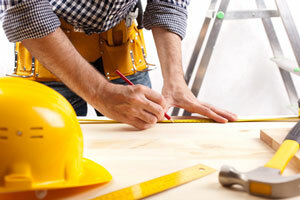 Thanks to this, you won’t have trouble finding a place for all your tools, regardless of size and shape. 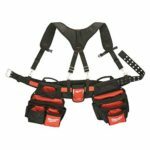 This tool bag has both hand straps and an adjustable shoulder strap. It’s made of top-quality polyester, which makes it a highly durable item. There’s not much to say about this bag in terms of disadvantages. Practically the only complaint people make is that it stores more than they can carry. Apart from this, though, it’s a really great solution for all your tools! 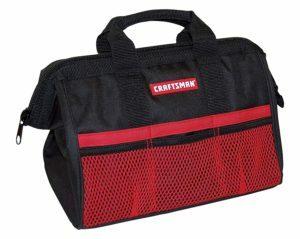 And last but not least, Craftsman makes some really good tool bags. They’re among the lightest and the most functional items of their kind. But let’s take a look at the pros and cons of this particular model! 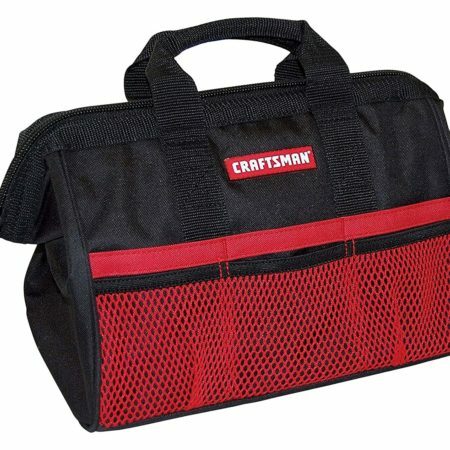 Made of incredibly light polyester, this bag won’t add much weight to your tools. Since it’s a 13-inch item, it’s spacious enough to hold all the essentials. It has six exterior pockets, three of which are mesh. The main pocket closes using a metal zipper. The handles are padded to provide you with improved comfort. Thanks to the reinforced bottom, you won’t have to worry about accidentally damaging your tools. There are some downsides to using the Craftsman model. First of all, it has no interior pockets, which makes organizing a bit more difficult. Second, it’s not equipped with a shoulder strap. 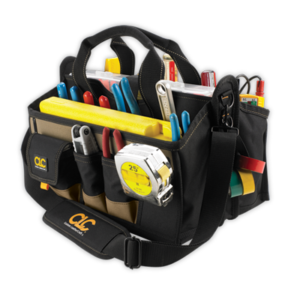 But despite all this, the tool bag is still one of the most highly rated storage options available!